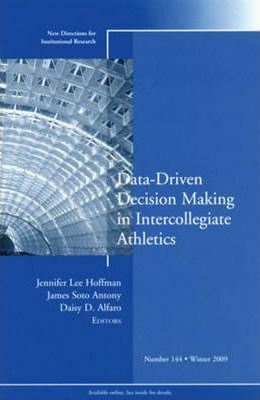 This volume introduces the reader to the primary and secondary sources of data on college athletics and their utility for decision making. The authors describe the existing landscape of data about student athletes and intercollegiate athletics and the measures that are still needed. Topics include: Finances and college athleticsMaking money -- or not -- on college sportsThe student athlete experienceGender equity, sport sponsorship, and participationData-driven decision making in practice: the NCAA Injury Surveillance SystemCollege athletics and student achievement: the evidence at small collegesThe collection and use of academic outcomes data by the NCAADecision making in hiring: intercollegiate athletics coaches and staffFaculty perception of intercollegiate athletics Data related to intercollegiate athletics are often a small part of campus financial and academic data reporting, but they generate significant interest at any institution that sponsors varsity sports. The demands for documentation, accountability and data-driven decision making related to college athletics have grown increasingly sophisticated. These demands come from the press, campus decision makers, researchers, state and federal agencies, the National Collegiate Athletic Association, and the public. Despite the growth of data sources and the ease of access that information technology affords, gaps still exist between what we think we know about college athletics and supporting data. The challenge for institutional researchers is to continue developing consistent data sources that inform the policy and governance of college athletics. This is the 144th volume of the Jossey-Bass higher education report series New Directions for Institutional Research. Always timely and comprehensive, New Directions for Institutional Research provides planners and administrators in all types of academic institutions with guidelines in such areas as resource coordination, information analysis, program evaluation, and institutional management.